It’s no big secret. ESL students won’t get very far if they have weak listening skills. A student puts on a pair of headphones and hits “play” on the computer screen. He/she is sitting down to watch a movie – in English – in order to improve his/her listening skills. What’s the purpose of this exercise? While “improve listening comprehension” sounds like a good purpose, it’s not. Students need specific exercises, each with a specific purpose that goes beyond mere “listening”. They can listen to a podcast with the purpose of identifying three future online shopping trends. They can listen to a conversation with the purpose of identifying the speaker’s vacation plans. But there should always be a purpose to the listening exercise. Be sure to communicate what it is. In the above situation where the student sits back and just listens, there is a misconception that he/she will passively improve his/her listening skills – just by listening. Students must be active in their listening exercises. They must be thinking of answers, options or ideas. Give them questions to answer or information to find out, and have them report back their findings. Separate them into groups and have one group listen for one set of information and the other group for another, and then get together and share. Just make sure they are not simply “sitting and listening”! Do they have to complete a True/False exercise after the listening? Fill in blanks as they listen? Write down the answers to the questions, or raise their hands and say them out loud? Students must be absolutely clear on what is expected of them. Do you always give your class song lyrics with gaps they must complete? Add some spice to your listening exercises and mix it up! What if you give two different groups two different sets of worksheets where the gaps are different? Students in Group A must then work with students in Group B and ask each other questions to find out the missing information. The class listens to the song at the end to confirm that the answers are right. We’re all more than familiar with the handy little audio CDs that come with our beloved course book. You should absolutely take advantage of the amount of listening material you have available there, but don’t forget to use some real audio from time to time. Now, movies, TV shows and songs are what usually comes to mind, but what about TV commercials, weather reports or podcasts? There are many more sources of real audio out there, most of which are not too hard for students if they are approached correctly. If students are really committed to improving their listening, they must understand this one crucial fact: they gotta do the work. This usually involves doing at least one short listening exercise, several times a week – even every day. They can watch a short video on YouTube or CNN.com every morning. Or listen to an audio book for 10 minutes every day. In class, be sure to give them listening comprehension exercises every day, maybe even several in one class. The more work they do, the faster they’ll improve. Check for meaning: He said he was feeling blue. Does that mean he was feeling sad? Ask for clarification: What did he mean when he said he was feeling blue? Re-phrase: He said he was feeling unhappy and sad, right? 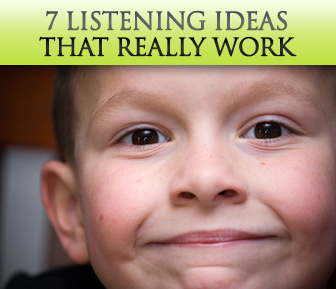 These are strategies that go a long way towards improving listening comprehension. Teach them these skills, and you’ll be teaching your students to be active and take their listening comprehension into their own hands. Students often believe that to improve their listening they must simply exercise their “ear”. But it’s important for students to understand that it’s not as simple as that – the ear is not a simple muscle to train; listening comprehension is a lot more complex than that. Merely sitting and listening to something for hours won’t do the trick; they can learn a lot more from a focused 15-minute listening exercise. Do you have any other tips to add to these? If so, share them below!